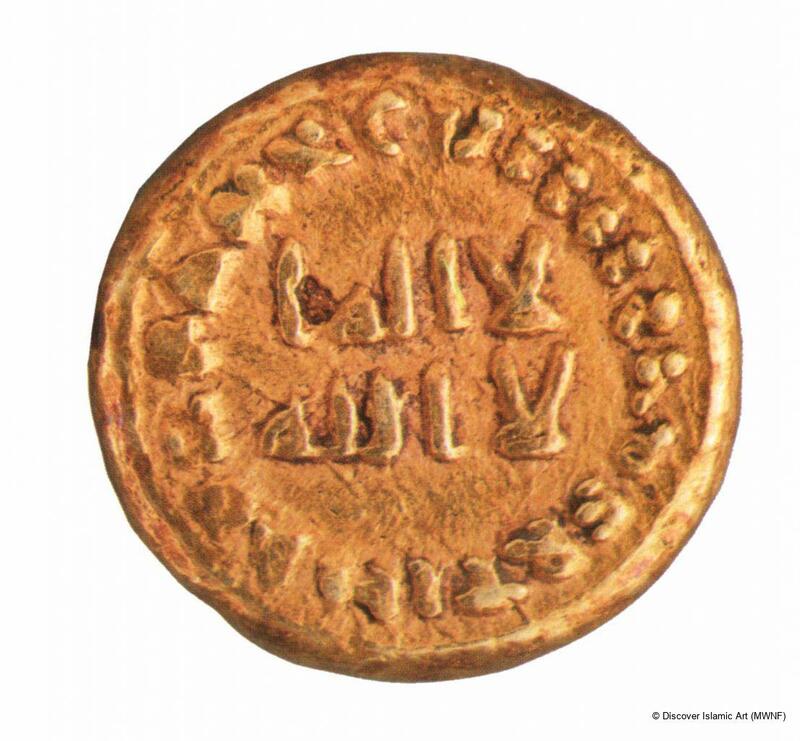 Beautifully made gold dinar, which belongs to the first and most original Umayyad coins. 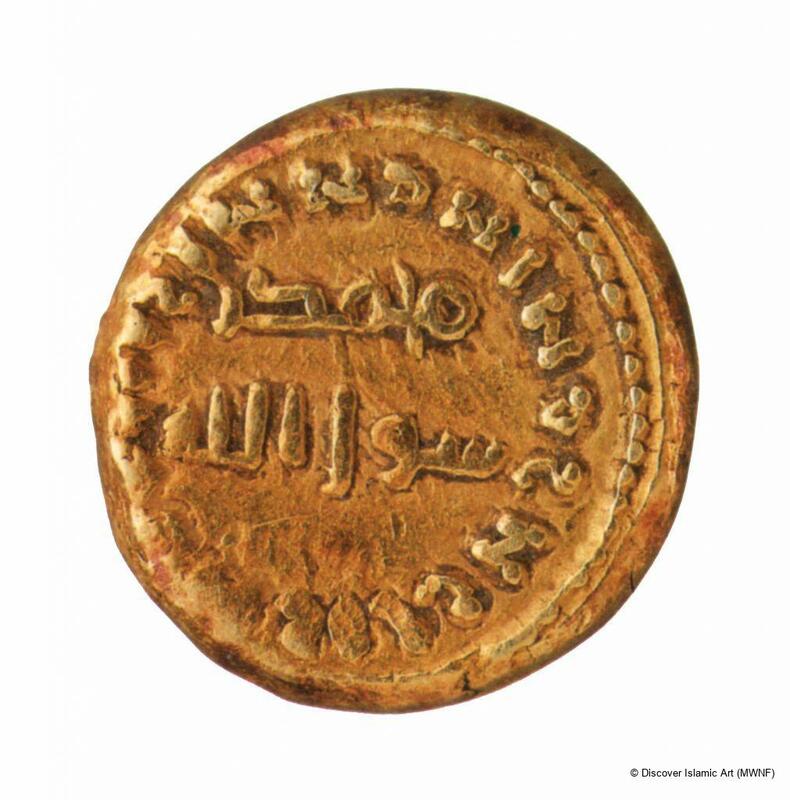 Issued in Ifriqiya under the rule of Sulayman (AH 96–99 / AD 715–17), son of 'Abd al-Malik, this coin includes the features that his father established for coining: the introduction of the dinar as an official currency, abolition of iconographic representations and an exclusive use of Arabic inscription. 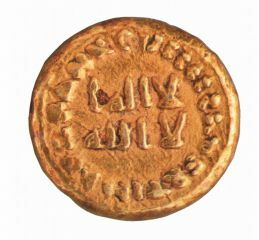 Thus, in accordance with contemporary practice, the most noticeable areas of the coin, the centre of the obverse and reverse, are inscribed with the professions of the Islamic faith in archaic kufic script: 'La ilaha ill allah' (There is no god but Allah) and 'Muhammad Rassul Allah' (Muhammad is God's prophet). However, contrary to prevailing practice, the circular legends on the obverse and reverse are written in abbreviated Latin characters, as on Byzantine coins from Africa. The obverse rim includes the monetary value, 'Solidus' (dinar), the place of striking, 'Feritus in Africa' (made in Africa) and the Hegira year it was struck 'Anno: XCVIII' (year 98). The circular legends in Latin script on the reverse proclaim God's uniqueness, 'In nomine Domini' (In the name of God), 'Non Deus Nisi Solus Deus' (there is no god but the one God), 'Non Deo Socius' (God has no equal). This demonstrates that the province of Ifriqiya was not entirely arabicised in that period. Moreover, there were some parts of its non-Islamised people that spoke only Latin. The authorities, governors named by the Umayyads, were obliged to strike dinars with Latin–Arabic legends and they had to use a language other than Arabic so as to spread the profession of the Islamic faith. Coins, essential for trading, were therefore used for religious propaganda. This dinar follows the rules laid down for Islamic coinage: iconographic representations were forbidden, and the profession of faith is in Arabic, although Latin is used for the value of the coin, its date and the proclamation of the oneness of God. Its originality lies in the way bilingualism is used as propaganda. The year is displayed in roman numerals on the obverse rim. The Bank of Morocco (al-Maghreb Bank) bought this dinar along with the rest of the Moroccan coins in the Brèthes collection. An enlightened numismatist, Brèthes lived in Morocco in the first half of the 20th century, and built up an important collection of coins found in Morocco from periods throughout its history, from Antiquity to 1940. The circular inscription on the obverse gives the place where the coin was struck. The Umayyads: The Rise of Islamic Art, pp.173–5. Ifriqiya: Thirteen Centuries of Art and Architecture in Tunisia.